At 04.00 the first officer, along with the cadet and oiler Dayra Wood (a graduate of the International Maritime University of Panama on her first voyage) went on watch. At 04.50, working alone, she made ready to transfer the bilge to the slop tanks in the engine room. At 05.00, she asked another cadet for help to get the emergency pump in place to discharge the bilge because the ship’s pump was faulty (It is strange that the AMP authorities gave the ship permission to sail having so many defects). According to a note issued by the captain, the first officer heard Dayra calling out his name in desperation. The note says that when he saw her caught up in the mechanism, his immediate reaction was to stop the machine using the emergency button. He went to Dayra Wood and found her dead. At 05.35, Captain José Galloway went down to the engine room. At 06.10, he called Javier Garcia at the ULTRAMAR agency in Panama. At 06.20, he called Cesar Centella at the agency in Panama and the latter e-mailed him a death certificate and information on the steps he should take. At 08.45, the body was removed from the scene of the accident. 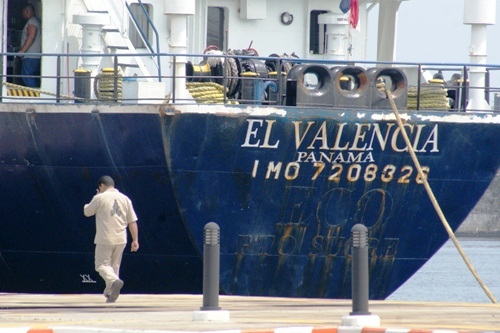 The above happened on 4 August and it is unclear why the company waited three days before officially informing the AMP (Panama Maritime Authority) on 7 August. It was only on 18 August that the AMP then informed the Mexican authorities, even though Dayra’s body was still on the ship, and being kept in the its refrigerator. Another two days passed because it was not clear whether it was the AMP or Mexico who had jurisdiction over the ship. Even then Dayra’s body was still not removed from the refrigerator and brought ashore. Nineteen days after the accident, on 23 August, the Panama inspector travelled with the deceased’s brother to Veracruz. There they met Enrique Lozano, ITF inspector and member of the Orden de Capitanes de Mexico, and Captain Ysmael Garcia, general secretary of the same union. On 24 August, with the assistance of the ITF-affiliated union in Mexico, a press conference was given to try and speed up the case and allow the deceased to be given a burial. The following day her body was finally taken for a post-mortem. On 29 August, the remains of Dayra Wood were transferred to Panama. On 31 August, almost four weeks after her death, she was given a Christian burial. Why didn’t the AMP notify the Mexican authorities immediately? Why did the Mexican authorities not detain the ship? Why did the body of the cadet stayed for so many days onboard in a refrigerator? There are reasons to believe that the certificates of some of the crew on the ship need examination, following rumors that some of them were bought. The AMP has withdrawn the ship’s certificates and the owners have reportedly tried to change the flag.